Throughout your pregnancy, you probably only need to look at your belly in the mirror to recognize that your baby is steadily gaining weight. During each phase of fetal development, your baby will grow significantly in terms of developing organs, body systems and senses. In addition, a fetus gains inches and weight throughout your pregnancy until she attains her birth weight. Baby Center emphasizes that all babies' weights are different, and you shouldn't worry about your baby's weight unless the doctor says it is a concern. In the very beginning of your pregnancy, your baby's weight is negligible, the Mayo Clinic reports -- she is, after all, only the size of a pencil eraser at seven weeks. According to BabyCenter, your child will weigh 0.04 ounces at eight weeks. By week 12 of your pregnancy, the end of the first trimester, your baby will be about two and a half inches long and weigh about half an ounce, the Mayo Clinic reports. 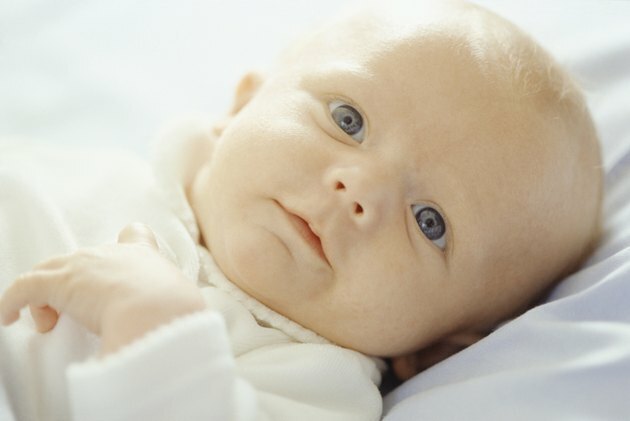 During your baby's second trimester, so many crucial aspects of development are occurring -- he's acquiring facial expressions, developing bones, and begins to hear. This is also the stage at which you'll be able to tell the gender of your baby. At week 14, your baby will weigh about one and a half ounces, and by week 20, the halfway mark of your pregnancy, he will weigh 11 ounces. By week 26, your baby's weight is measured in pounds, and you can expect him to weigh about 2 pounds. The third trimester is when your baby goes through her final phase of fetal development. At this point, she opens her eyes, and her eyelashes are formed. Weight gain at this stage also serves to fill out facial wrinkles, reports the Mayo Clinic. Her bones also become fully developed, and she begins to try breathing and observe light. At week 30, she will weigh nearly three pounds, and at week 36, there is a fast and significant weight gain toward the final birth weight. The Mayo Clinic reports that starting at week 36, your baby gains about half a pound per week for the next month. Although the average birth weight is about seven and a half pounds, there is great variation in this.